The Oder (Czech an Pols: Odra) is a river in Central Europe. 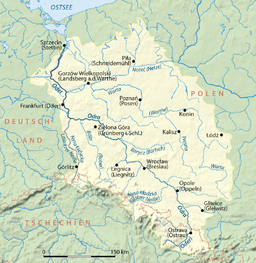 It rises in the Czech Republic an flows (generally north- an northwast-ward) through wastren Poland, later formin 187 kilometres (116 mi) o the border atween Poland an Germany, pairt o the Oder–Neisse line. This page wis last eeditit on 3 Mairch 2018, at 23:40.